To Flix or net to Flix? Well, it’s been about a year that we’ve had NetFlix. It started because Lauren found out that she could watch movies on her computer. She happily did that for maybe a month before I wondered why she didn’t get any DVDs. It turns out that she wasn’t interested in getting any DVDs, so I’ve had the NetFlix queue mostly to myself for the better part of a year. I like movies, and there are a fair number that I always meant to see, but I never did. Now if someone mentions a movie they like, or I see a reference to one that sounds interesting I just add it to the list (there’s an app for that). My list is about 12 movies long, so it’s about 3 months later that they send me that movie. It’s always a surprise when it arrives. Their turn-around time is amazing. If I put a movie in the mail on Thursday I get a new movie on Saturday. But there are some drawbacks. Since we started we’ve rented 36 movies and spent about $99.00 doing so. Roughly $2.75 a movie. Much cheaper than going to a movie, but maybe not worth it if you compare it to renting movies in Seward (which costs around $2.00). Except we never do. The other big downer is that I always feel like I should watch the movie right away to that I’m getting my money’s worth. There are no late fees, but if I sit on it too long then I feel like I’m wasting my $8.99 per month. There are currently 14 movies in the queue, and I don’t know if I’ll keep going after that. Lauren doesn’t use it much on her computer anymore, and my dad is retired from the Post Office, so I don’t have to worry about covering his paycheck. There’s a neat NetFlix feature where you can see what your friends are watching. So far Kristi is my only friend. If you have NetFlix, will you be my friend? Did you save those mailing envelope cast-offs? I think you might have a problem of some kind. 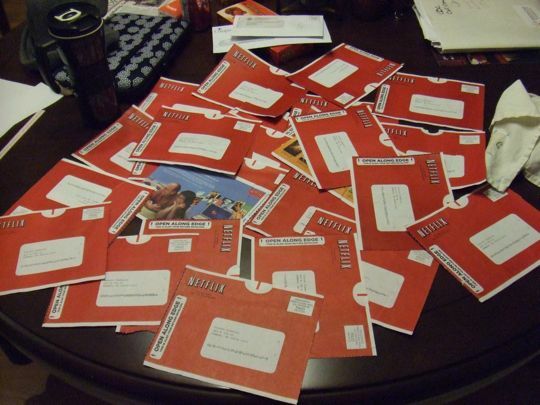 What would you take a picture of if you wanted to post about Netflix? Huh? Did you ever think of that? Huh? Did you? Well? Did you? Personally, I could drop Netflix at any time. I’m too tired at night to commit to a whole two hours of something. A movie sounds like a chore. And that last statement, my friends, is exactly why I don’t care for movies. Dr. Horrible’s Sing-Along Blog gets 5 stars, yet Adding and Subtracting Integers only gets 1? Who’s rating these things? The red stars are how much they think we’ll like the movie. The yellow stars are our rating of the movie. That’s what they base their stars on. Netflix recently had a contest where they awarded ONE MILLION DOLLARS to the person/people who could improve their recommendations the most. As for Adding and Subtracting Integers, taping me teaching it on a blackboard would have resulted in better instruction. 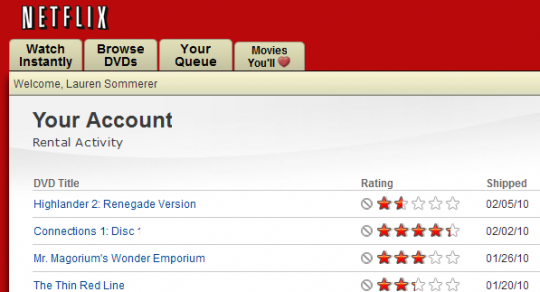 I did Netflix for about a year…but then stopped. But if you ever want a movie review, I’ve seen just about every movie out there. You have my email address. Yeah, you normally can’t see someone’s queue unless you’re their friend. So I just copied the whole page and transplanted it.